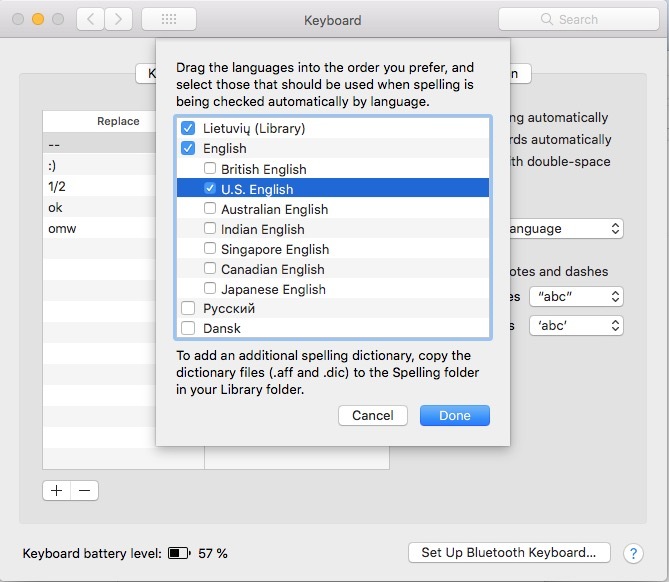 System preferences -> Keyboard -> Text(tab) -> "Automatic by Language" settings does not work with 3rd party spelling dictionaries. Yes, i've done "Set Up..." which is last option language selection. Yes, i've only check-marked only those(two) languages that i'm interested(English, Lithuanian). Yes, i switch keyboard layout in the document to a language layout i indend to use. I've chosen option Spelling and Grammar -> Check spelling -> While typing. And it fails. It underlines words in red. When i ask to present me with correct options, it presents with the list and in this list there are those exact words, presented in the same way 1:1, but somewhy when i type it things it's wrong. Why is that and how to correct this ? 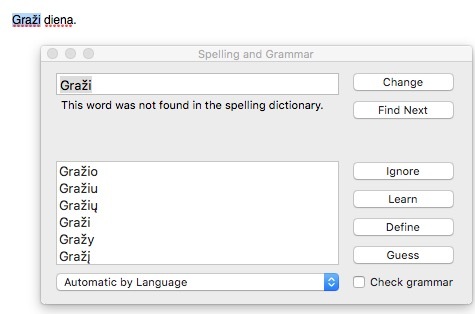 By the way everything works perfect if i deselect "Automatic by Language" and choose one language, thus everything is ok with spelling dictionaries.